Your heating and cooling system is where you spend most of your energy dollars so saving on your utilities is important. 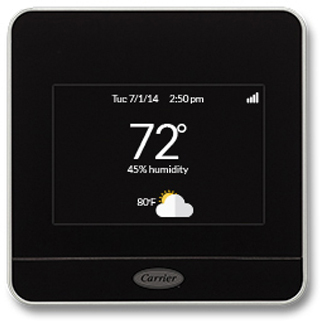 The innovative Côr™ thermostat is designed to combine home comfort with reduced energy use; homeowners saved an average of 20% on their heating and cooling energy costs.1 It's what we call the heart of a smarter home. It's all about helping you keep your hard-earned money through smart energy use. Features like smart setback let the thermostat intelligently adapt beyond manual programming for greater efficiency, while still meeting your ideal comfort levels. Energy reports help you see exactly when your energy dollars are being spent so you can modify settings to maximize savings. It will even provide you customized energy saving tips.